1685 ~ 1710: born in Ôsaka. He was a wakashugata actor and his first stage names were Toyoshima Katsunosuke and Toyoshima Katsusaburô. He became a disciple of Somekawa Jûrobê in 1710. 11th lunar month of 1710: Toyoshima Katsusaburô took the name of Anegawa Shinshirô I in Ôsaka, playing in the kaomise drama "Shinzome Hinagata Chôja", which was produced by Arashi San'emon III for the nadai Ôsaka Kuzaemon. 11th lunar month of 1711: Shinshirô played the role of Okinoishi Hankurô in the kaomise drama "Daimyô Hitachi Obi", which was produced by Arashi San'emon III for the nadai Ôsaka Kuzaemon. 7th lunar month of 1713: Shinshirô played the role of Abe no Yasuna in the drama "Shinoda Zuma Yome Kurabe", which was produced by the zamoto Shinozuka Shômatsu I for the nadai Ôsaka Tazaemon. 11th lunar month of 1714: Shinshirô became zamoto and produced for the nadai Ôsaka Kuzaemon the kaomise drama "Daikoku Shinmai Dawara" in which he played the role of the karô Sazareishi Sen'emon. 11th lunar month of 1716: Shinshirô played in Ôsaka in the drama "Kogane no Ichigura", which was produced by Sawamura Chôjûrô I. 11th lunar month of 1717: Shinshirô played in Ôsaka at the Higashi no Shibai the role of Katsuragawa Sagoemon in the kaomise drama "Meryû Oryû Kogane no Uroko", which was produced by Arashi San'emon III. 1st lunar month of 1719: first Kabuki adaptation of Chikamatsu Monzaemon's 1708 puppet theater drama "Keisei Hangonkô" by Kyôya Yagoshirô, which was produced by Arashi San'emon III in Ôsaka at the Kado no Shibai; Shinshirô played the role of Nagoya Sanza [casting]. 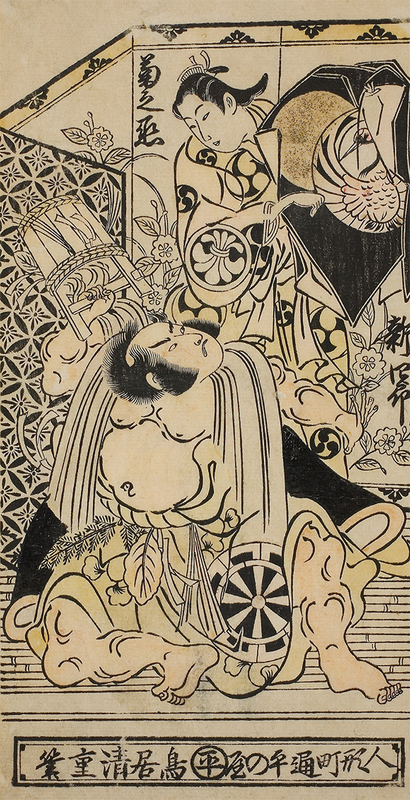 1st lunar month of 1720: first Kabuki adaptation of Chikamatsu Monzaemon's puppet theater drama "Heike Nyogo no Shima", which was produced by Takeshima Kôzaemon II in Ôsaka at the Naka no Shibai; Shinshirô played the role of Shunkan [casting]. 11th lunar month of 1720: Shinshirô played at the Kado no Shibai in the kaomise drama "Hana Yakata Chibikizuru", which was produced by Kirinoya Gonjûrô I. 9th lunar month of 1722: Shinshirô played at the Kado no Shibai the role of Kurofune in the drama "Raijin Mondôki", which was produced by Kirinoya Gonjûrô I. 11th lunar month of 1722: Shinshirô settled in Kyôto and played the role of Tamagaki Tôzô in the kaomise drama "Senbon Matsu Tokiwa Yakata", which was produced by Sakakiyama Shirotarô I for the nadai Hayagumo Chôdayû. He also played the role of Kurofune Chûemon in the dance "Otoko Moyô Nimai Hinagata". His performance was a great success and the turban (zukin) that Shinshirô used on stage in the role of Kurofune became the latest fashion in the city of Kyôto; it was sold under the name "anegawa zukin". 1723: Shinshirô played in Kyôto the role of Shundô Jirôemon in the drama "Hinin no Adauchi". 11th lunar month of 1723: Shinshirô played in Kyôto the role of Kurofune Chûemon in the kaomise drama "Teono Hajime Kogane no Ishizue", which was produced by Segawa Kikunojô I. 1st lunar month of 1724: Shinshirô's rank in the Kyôto hyôbanki, tachiyaku section, was jô-jô-kichi (superior - superior - excellent). 11th lunar month of 1726: Shinshirô played at Kameya Kumenojô's theater (Kyôto) the role of Todoroki Kôemon in the kaomise drama "Karanishiki Imose no Shitone", which was produced by Matsushima Hyôtarô. Fall 1727: Shinshirô went back to Ôsaka. 11th lunar month of 1727: Shinshirô played at the Naka no Shibai in the kaomise drama "Imose Gami Aioi no Futabayama", which was produced by Yamamoto Kyôshirô I. 1st lunar month of 1728: Shinshirô's rank in the Ôsaka hyôbanki, tachiyaku section, was dai-jô-jô-kichi (grand - superior - superior - excellent). 11th lunar month of 1729: Shinshirô produced at the Naka no Shibai the kaomise drama "Daimyô Yakata Manpô no Mikura", in which he played the roles of Sagosuke and Tabiya Gembei. Fall 1732: the actors Shinshirô, Sakakiyama Koshirô I and Arashi Otonosuke I went together to Edo. 11th lunar month of 1732: Shinshirô played at the Nakamuraza the role of Watanabe Minbu in the kaomise drama "Yamato Kotoba Imagawajô". 1st lunar month of 1733: Shinshirô's rank in the Edo hyôbanki, tachiyaku section, was jô-jô-kichi (superior - superior - excellent). He played at the Nakamuraza the role of Kurofune Chûemon in the drama "Kurofune Deiri Minato". Spring 1734: Shinshirô played at Nakamuraza in the new year drama "Jûhakkô Imayô Soga". Fall 1734: Shinshirô went back to Kamigata. 11th lunar month of 1734: Shinshirô played at the Ônishi no Shibai the role of Kanda Sagoemon in the kaomise drama "Asahi no Matsu Kogane no Shinbashira", which was produced by Nakamura Jûzô I. His two adopted sons, Anegawa Shinnosuke and Anegawa Tôjûrô, work as zamoto; the former in Ôsaka and the latter in Kyôto. 11th lunar month of 1736: Shinshirô played the role of Taema Sagoemon in the kaomise drama "Yamato Fumi Mannen no Ayatsuri", which was produced by Iwai Hanshirô III at the Kado no Shibai. 11th lunar month of 1738: Shinshirô played in Iwai Izaemon's kaomise drama "Furômon Tama no Kizahashi", which was produced by his adopted son Anegawa Tôjûrô in Kyôto for the nadai Ebisuya Kichirôbê. 12th lunar month of 1739: Shinshirô played the role of Matahei in the drama "Kewai Musha Ômi Genji", which was produced at the Ônishi no Shibai by Yoshizawa Ayame II; his stage partners were Yoshizawa Ayame II (Okichi), Nakamura Sôjûrô (Shôgen), Sakakiyama Shirotarô I (Nagoya Sanza), Arashi Shichigorô I (Fuwa Banzaemon) and Segawa Kikunojô I (the courtesan Tôyama). Summer 1740: Shinshirô played the role of Jingorô in the drama "Kaga no Kuni Shinohara Gassen", which was produced at the Ônishi no Shibai by Yoshizawa Ayame II. 11th lunar month of 1741: Shinshirô became zamoto in Ôsaka at the Naka no Shibai, where he produced the kaomise drama "Genji Rokujûjô". 7th lunar month of 1742: Shinshirô played at the Kado no Shibai the role of Shunkan in the drama "Yuya Gozen Taira Monbi"; his stage partners were Arashi Koizô I (Chidori), Sakurayama Shirogorô (Tanzaemon) and Kamakura Heikurô I (Senoo Tarô). 11th lunar month of 1742: Shinshirô became zamoto at the Naka no Shibai. 1st lunar month of 1743: Shinshirô produced at the Naka no Shibai the play "Kurofune Isse Ichidai Otoko" [casting] in which he played the roles of Kurofune Chûemon and Ageya Rokuroemon. The turban (zukin) and the wooden clogs (geta), which he used on stage, became the latest fashion in the city of Ôsaka; they were sold under the names of "anegawa zukin" and "anegawa geta". 11th lunar month of 1743: Shinshirô produced at the Naka no Shibai the kaomise drama "Shiki Samba Ôgi Ikusa", which celebrated the shûmei of Shinozuka Jirozaemon II. 7th lunar month of 1744: Shinshirô produced in the same theater the drama "Otoko Date Gojitsu Kagami" in which he played the role of Nuregami Chôgorô; his stage partners were Yoshizawa Ayame II, Yoshizawa Sakinosuke II, Fujikawa Hanzaburô II and Yamanaka Heijûrô I. 10th lunar month of 1745: Shinshirô worked as a zamoto for the last time, producing at the Naka no Shibai the dramas "Shin Usuyuki Monogatari" and "Imaori Daikanjima". 11th lunar month of 1745: Shinshirô went to Kyôto and played at the Kitagawa no Shibai in the kaomise drama "Kachidoki Manzairaku", which was produced by Nakamura Kiyosaburô I for the nadai Miyako Handayû. 1st lunar month of 1746: Shinshirô played in the same theater the role of Matahei in the drama "Matahei". His stage partners were Sanogawa Hanazuma II (Otoku), Anegawa Daikichi I (Nagoya Sanza), Nakamura Utaemon I (Fuwa Banzaemon) and Nakamura Kiyosaburô I (the courtesan Tôyama). 9th lunar month of 1746: first Kabuki adaptation of Takeda Izumo I, Miyoshi Shôraku, Namiki Senryû I and Takeda Koizumo puppet theater drama "Sugawara Denju Tenarai Kagami", which was produced by Nakamura Kiyosaburô I at Miyako Mandayû's theater (the Kitagawa no Shibai); Shinshirô played the role of Takebe Genzô [casting]. 1st lunar month of 1747: Shinshirô's rank in the Kyôto hyôbanki, tachiyaku section, was shin-jô-jô-kichi (truly - superior - superior - excellent). 8th lunar month of 1748: the drama "Yoshitsune Senbon Zakura" was performed for the first time in Ôsaka, at the Naka no Shibai; Shinshirô played the roles of Yazaemon and Noritsune [casting]. 12th lunar month of 1748: the play "Kanadehon Chûshingura", which was originally written for the puppet theater, was adapted for Kabuki for the first time, in Ôsaka at the Kado no Shibai; Shinshirô played the roles of Ishidô Umanojô and Amakawaya Gihei [casting]. 25th day of the 11th lunar month of 1749: Shinshirô died in Ôsaka. Later on, somebody found in a river a pair of wooden clogs and a turban similar to Shinshirô's ones. Ôsaka people interpreted it as the proof that Shinshirô went to heaven. The 25th day of the 11th lunar month of the 2nd year of the Kan'en era was the 3rd of January 1750 in the western calendar.